The Navy's greatest navigational tragedy took place in September 1923 at an isolated California coastal headland locally known as Honda Point. Officially called Point Pedernales, Honda is a few miles from the northern entrance of the heavily-traveled Santa Barbara Channel. Completely exposed to wind and wave, and often obscured by fog, this rocky shore has claimed many vessels, but never more at one stroke than at about 9 PM on the dark evening of 8 September 1923, when seven nearly new U.S. Navy destroyers and twenty-three lives were lost there. Just over twelve hours earlier Destroyer Squadron ELEVEN left San Francisco Bay and formed up for a morning of combat maneuvers. In an important test of engineering efficiency, this was followed by a twenty-knot run south, including a night passage through the Santa Barbara Channel. In late afternoon the fourteen destroyers fell into column formation, led by their flagship, USS Delphy. Poor visibility ensured that squadron commander Captain Edward H. Watson and two other experienced navigators on board Delphy had to work largely by the time-honored, if imprecise, technique of dead reckoning. Soundings could not be taken at twenty knots, but they checked their chartwork against bearings obtained from the radio direction finding (RDF) station at Point Arguello, a few miles south of Honda. At the time they expected to turn into the Channel, the Point Arguello station reported they were still to the northward. However, RDF was still new and not completely trusted, so this information was discounted, and DesRon 11 was ordered to turn eastward, with each ship following Delphy. However, the Squadron was actually several miles north, and further east, than Delphy's navigators believed. It was very dark, and almost immediately the ships entered a dense fog. About five minutes after making her turn, Delphy slammed into the Honda shore and stuck fast. A few hundred yards astern, USS S.P. Lee saw the flagship's sudden stop and turned sharply to port, but quickly struck the hidden coast to the north of Delphy. Following her, USS Young had no time to turn before she ripped her hull open on submerged rocks, came to a stop just south of Delphy and rapidly turned over on her starboard side. The next two destroyers in line, Woodbury and Nicholas, turned right and left respectively, but also hit the rocks. Steaming behind them, USS Farragut backed away with relatively minor damage, USS Fuller piled up near Woodbury, USS Percival and Somers both narrowly evaded the catastrophe, but USS Chauncey tried to rescue the men clinging to the capsized Young and herself went aground nearby. The last four destroyers, Kennedy, Paul Hamilton, Stoddert and Thompson successfully turned clear of the coast and were unharmed. In the darkness and fog enveloping the seven stranded ships, several hundred crewmen were suddenly thrown into a battle for survival against crashing waves and a hostile shore. 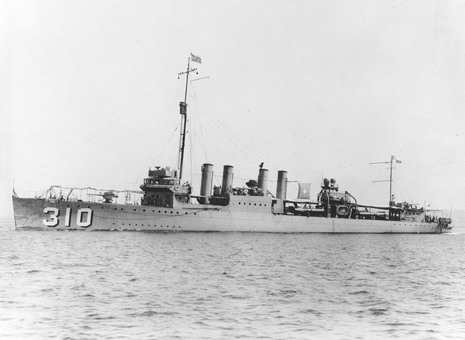 The Honda Point Disaster was the largest peacetime loss of U.S. Navy ships. On the evening of September 8, 1923, seven destroyers, while traveling at 20 knots (37 km/h), ran aground at Honda Point, a few miles from the northern side of the Santa Barbara Channel off Point Arguello on the coast in Santa Barbara County, California. Two other ships grounded, but were able to maneuver free of the rocks. Twenty three sailors died in the disaster. The fourteen ships of Destroyer Squadron 11 (DESRON 11) made their way south from San Francisco Bay to San Diego Bay in the late summer of 1923. The squadron was led by Commodore Edward H. Watson, on the flagship destroyer USS Delphy leading the squadron. All were Clemson-class destroyers, less than five years old. The ships turned east to course 095, supposedly into the Santa Barbara Channel, at 21:00. The ships were navigating by dead reckoning, estimating their positions by their headings and speeds, as measured by propeller revolutions per minute. At that time radio navigation aids were new and not completely trusted. The USS Delphy was equipped with a radio navigation receiver, but her navigator and captain ignored its indicated bearings, believing them to be erroneous. No effort was made to take soundings of water depth. Those operations were not performed because of the necessity to slow the ships down to take measurements. The ships were performing an exercise that simulated wartime conditions, hence the decision was made not to slow down. In this case, the dead reckoning was wrong, and the mistakes were fatal.